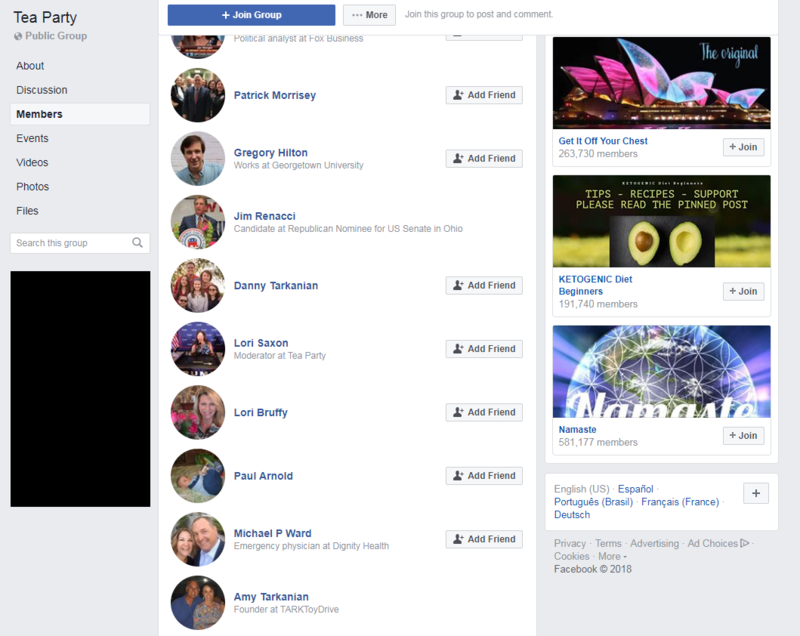 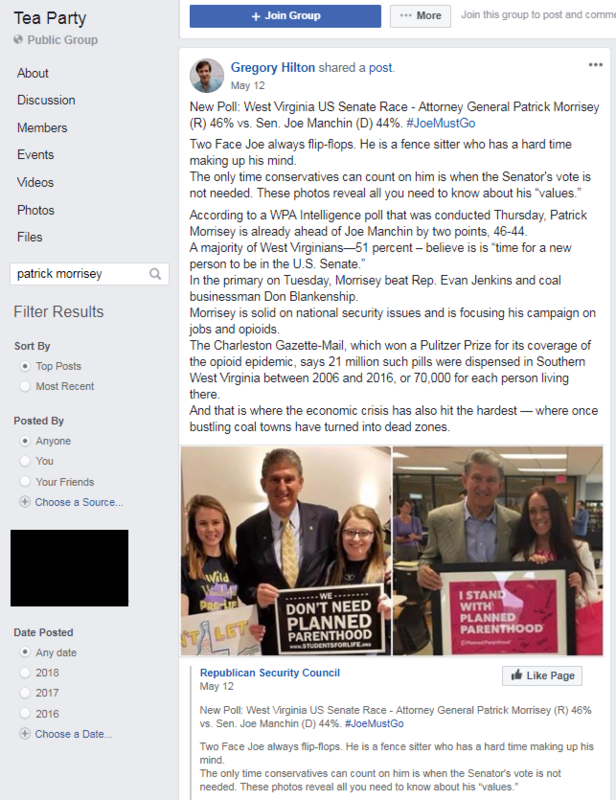 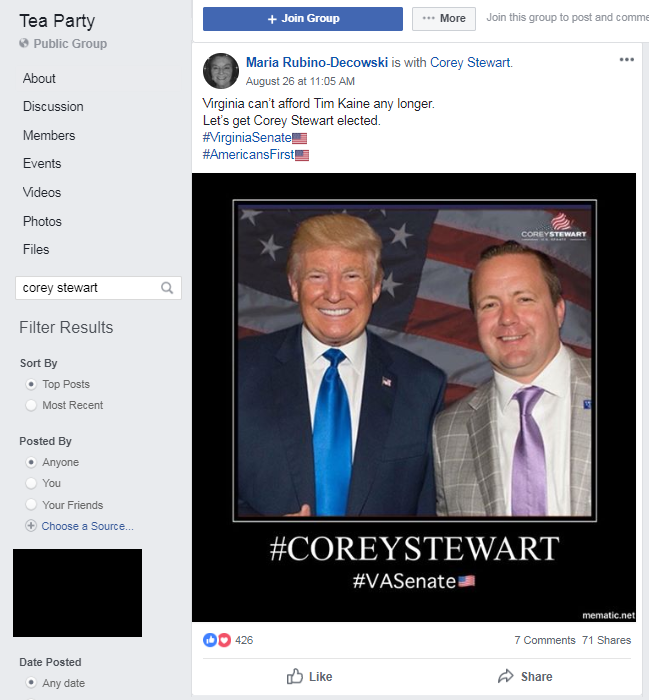 UPDATE (8/31 12:20 p.m.): Corey Stewart and Daniel Crenshaw are no longer listed as administrators and moderators of the Facebook group “Tea Party.” Stewart is a neo-Confederate who is running to represent Virginia in the Senate. 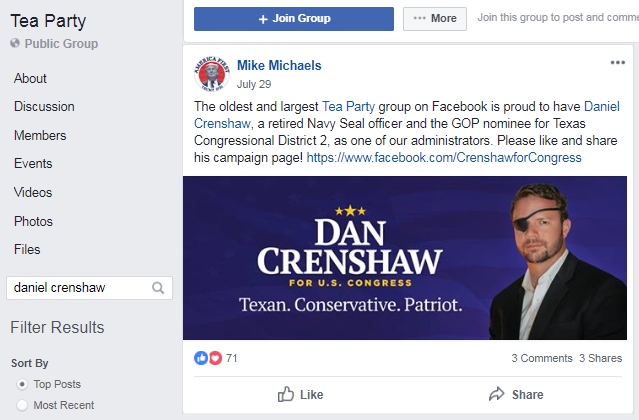 Crenshaw is running to represent Texas’ 2nd Congressional District. 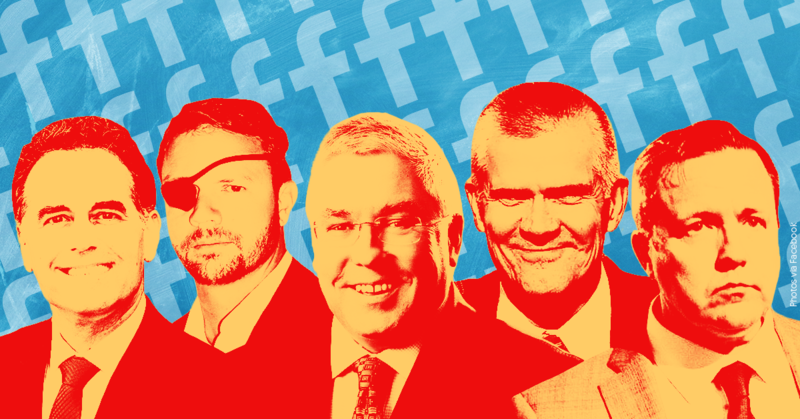 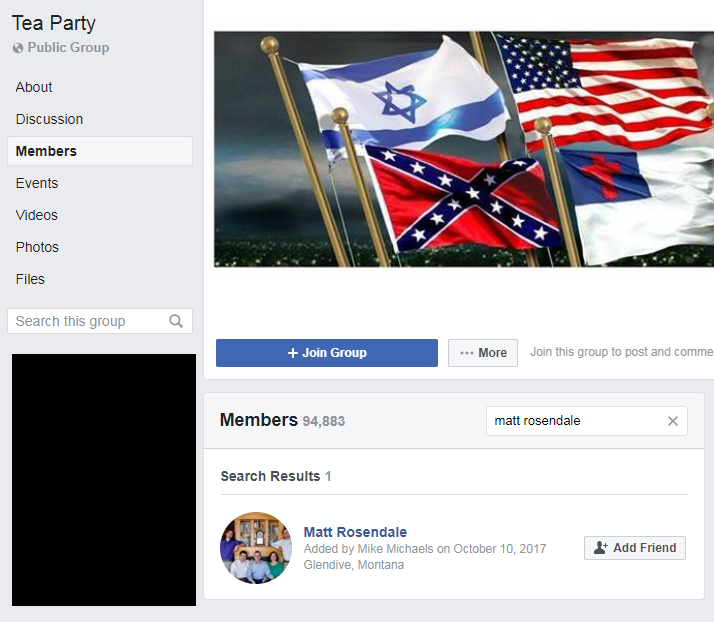 All five of the Republican candidates who were listed as administrators and moderators of the group at the time of publication have left the Facebook group. 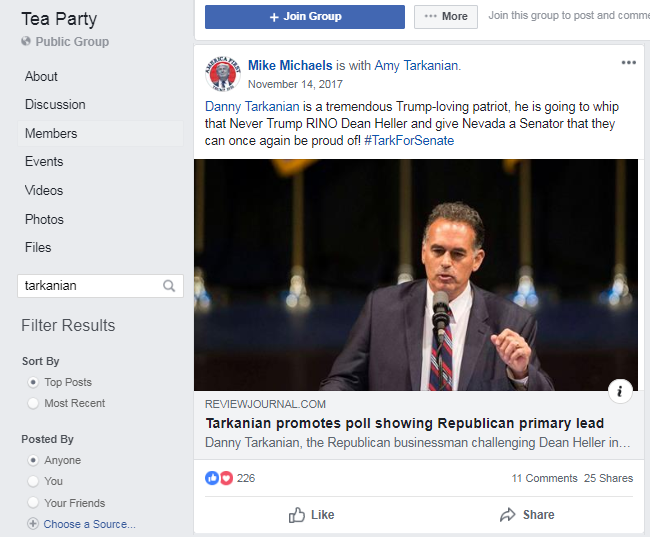 Rep. Jim Renacci and Rep. Ron DeSantis left the group prior to publication of this post. 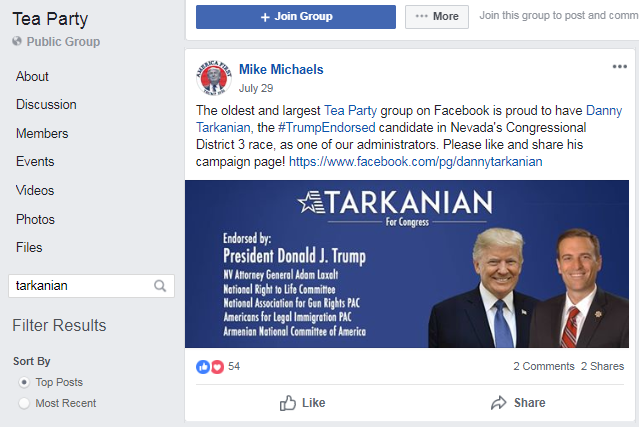 Five GOP-backed Republicans running for office in 2018 are listed  as administrators and moderators for a racist, conspiracy theory-pushing Facebook group  called “Tea Party.” Some of the group’s administrators have spread hate speech  against  Muslims  and Black activists , and have pushed the Pizzagate  conspiracy theory and other false stories about Seth Rich’s  murder , the Clintons , and the Unite the Right  rally in Charlottesville, to the group’s almost 95,000 members. 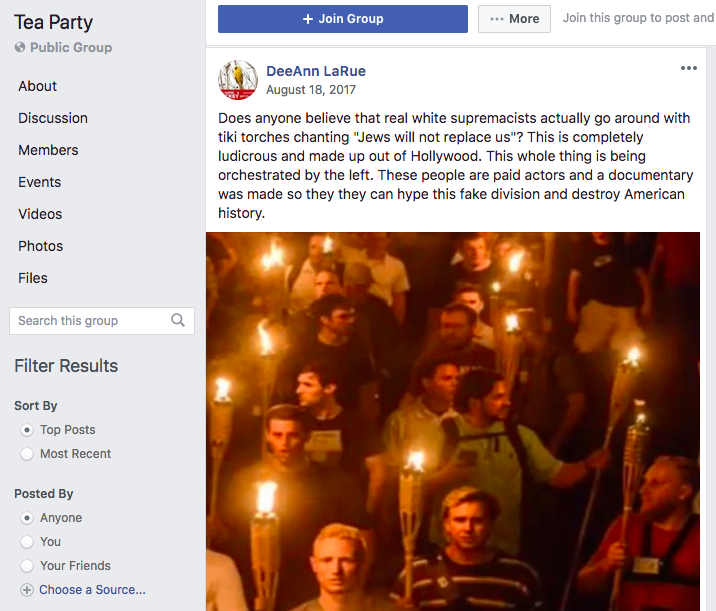 Rep. Ron DeSantis (R-FL) recently came under harsh  scrutiny  for his involvement  in the same Facebook group, where he was listed as an administrator until August 29. 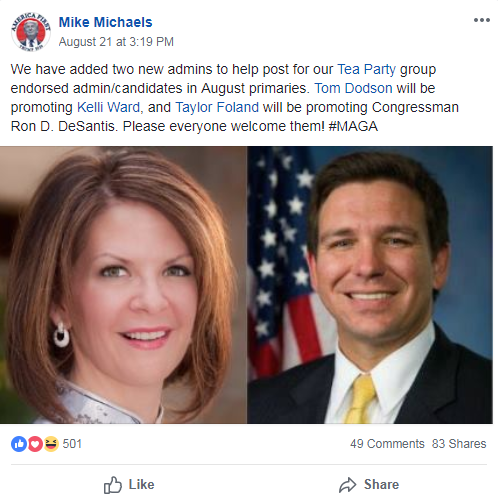 A former employee  of the anti-Muslim  ACT for America was brought on as an administrator  to campaign for DeSantis in the group about a week ago. 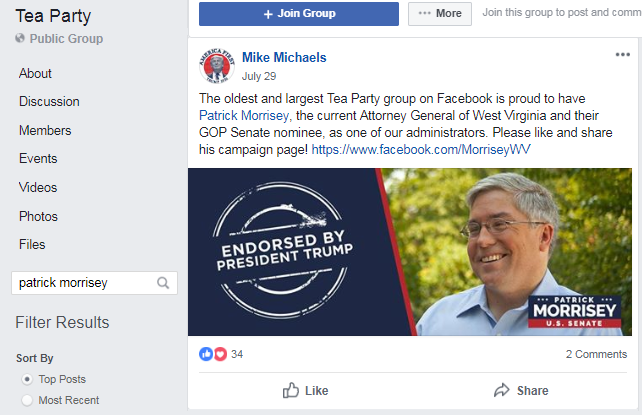 Patrick Morrisey, running to represent West Virginia in the Senate. 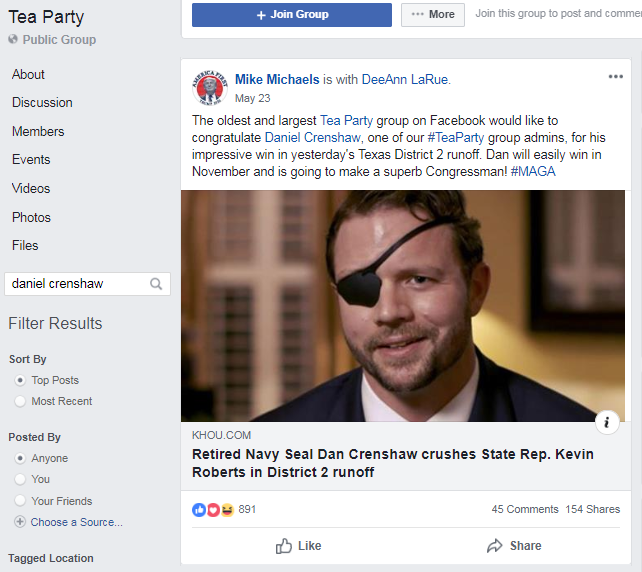 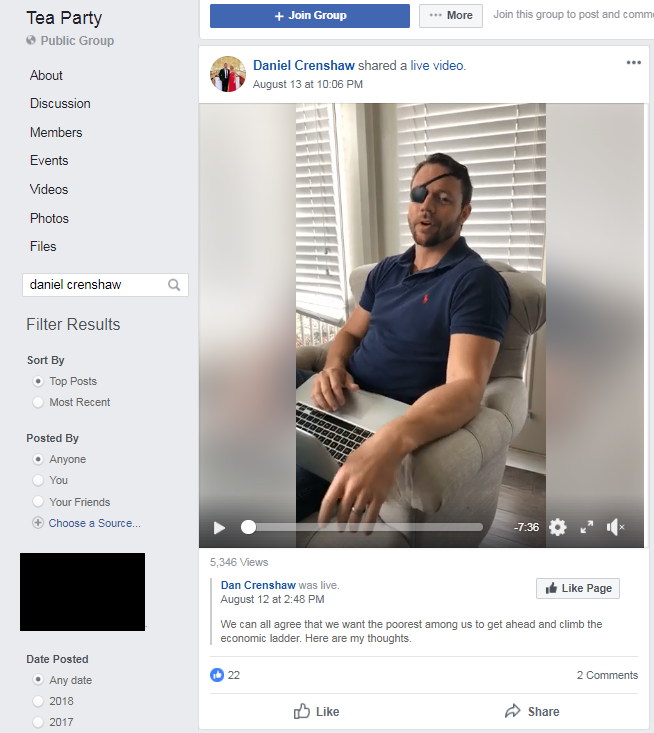 Daniel Crenshaw has been a member of the Tea Party group since May 2018. 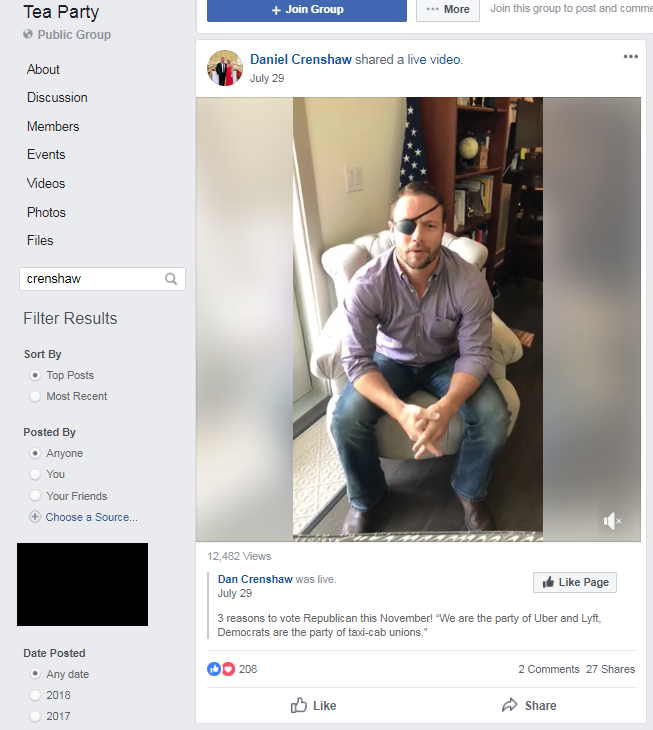 He has shared Facebook  videos  from his congressional campaign page twice, with the most recent share coming on August 13. 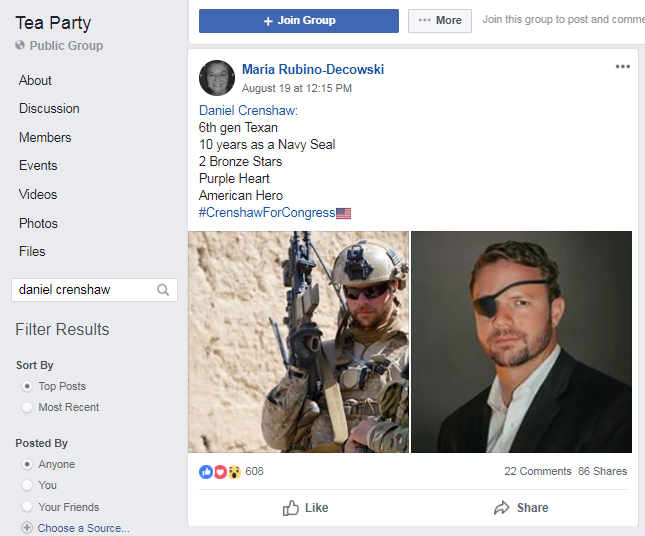 A few  other  administrators  have  promoted Crenshaw’s candidacy and shared his Senate campaign’s Facebook page. 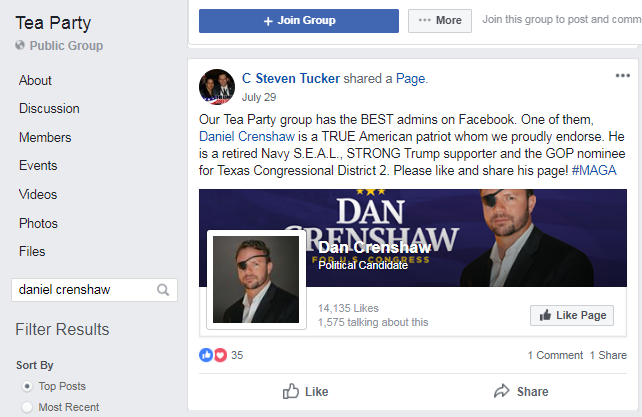 Some of these posts identified Crenshaw as an administrator for the group. 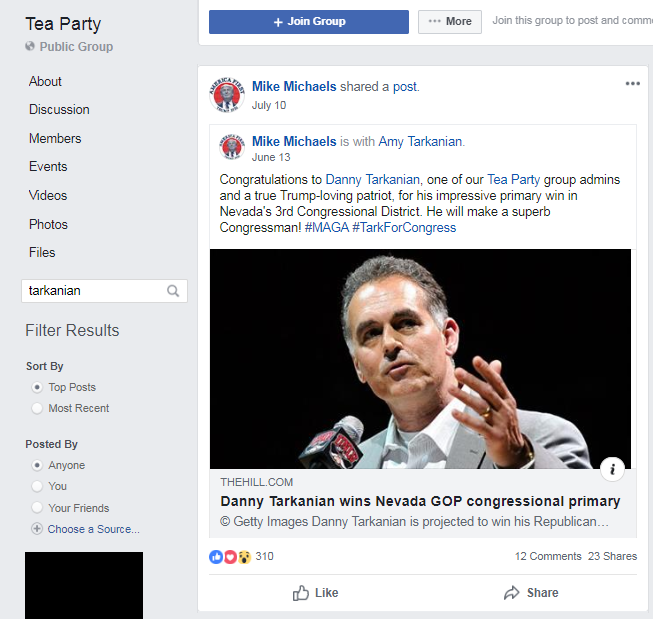 Danny Tarkanian and his wife, Amy Tarkanian (a former chair of the Nevada Republican Party ), are both listed as administrators of the group. 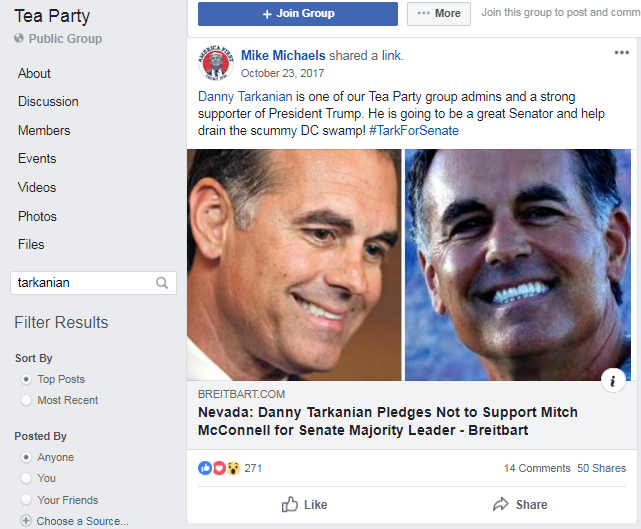 Administrators of the group have been promoting Danny Tarkanian since  2017 , when he was running for Dean Heller’s Senate seat in Nevada (he later withdrew ). 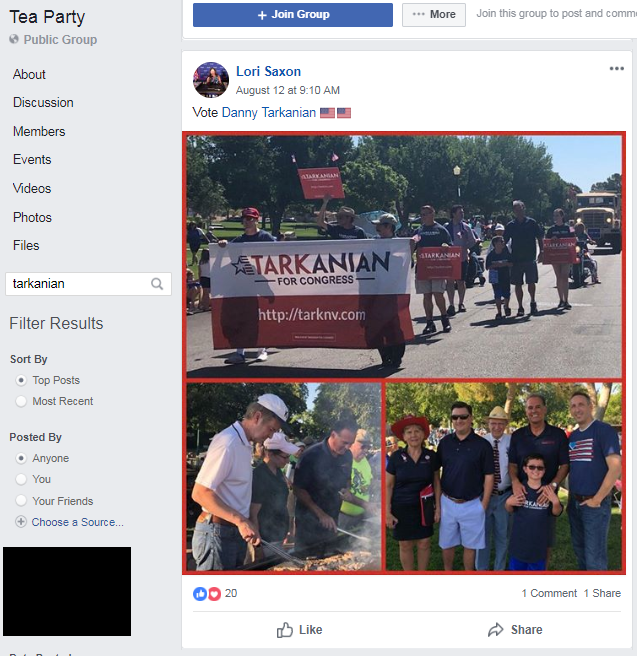 Administrators have also  promoted  Tarkanian’s  2018  run  for the House. 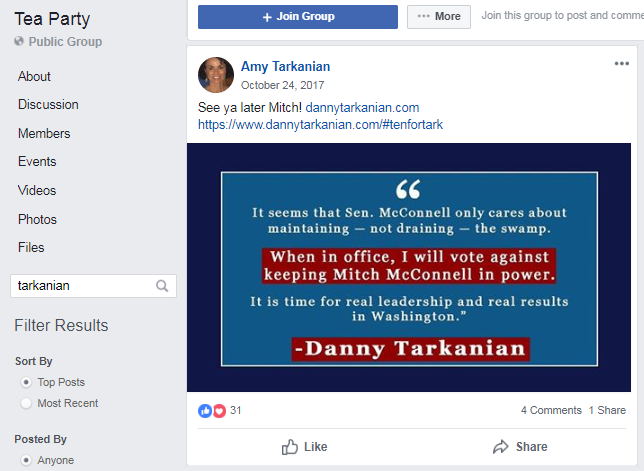 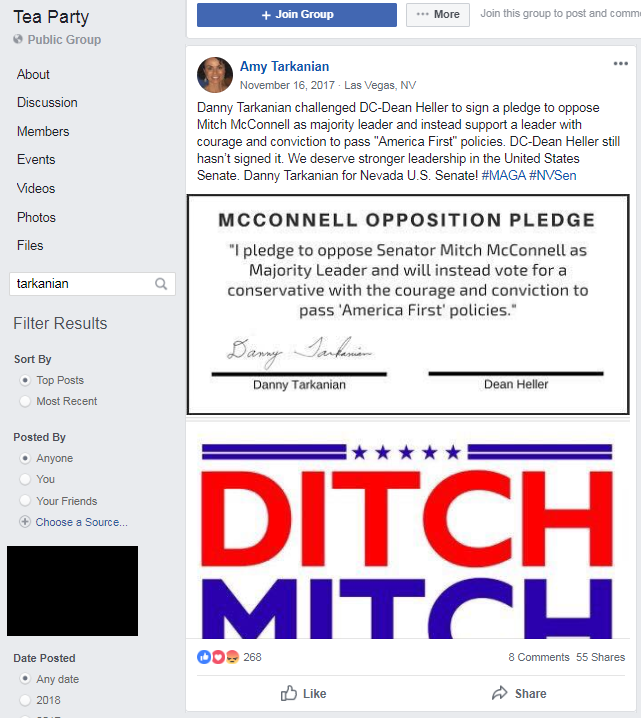 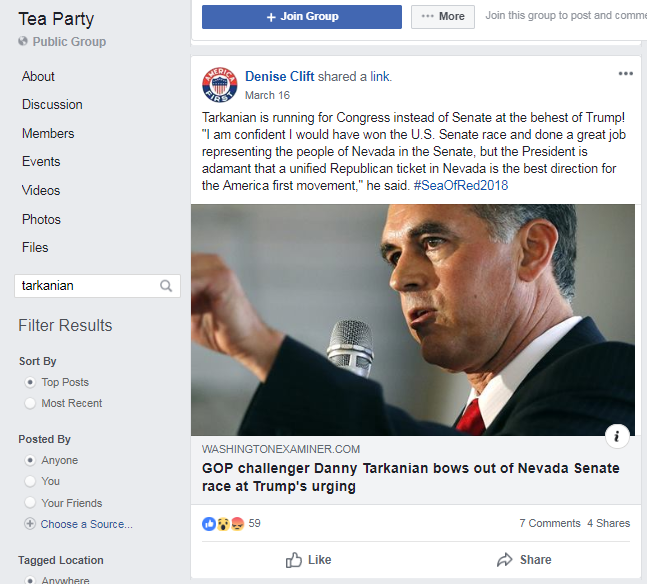 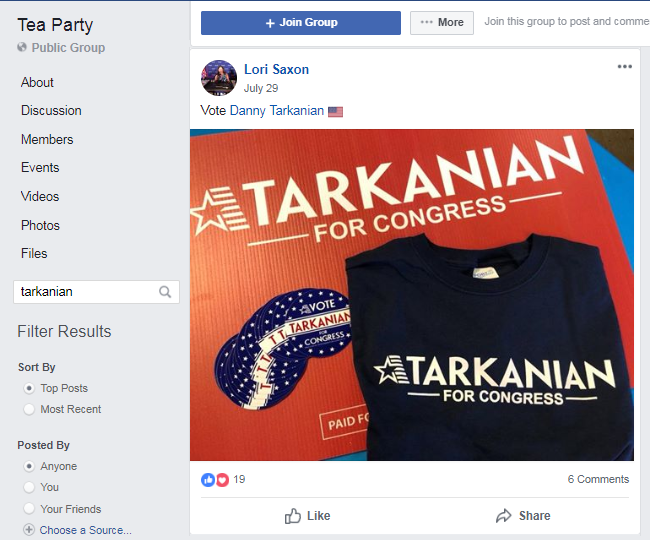 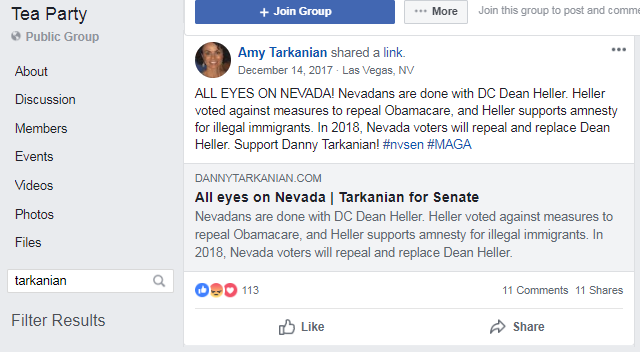 Although Danny has not posted in the group, Amy Tarkanian promoted his Senate campaign in the  group  multiple  times  in 2017. 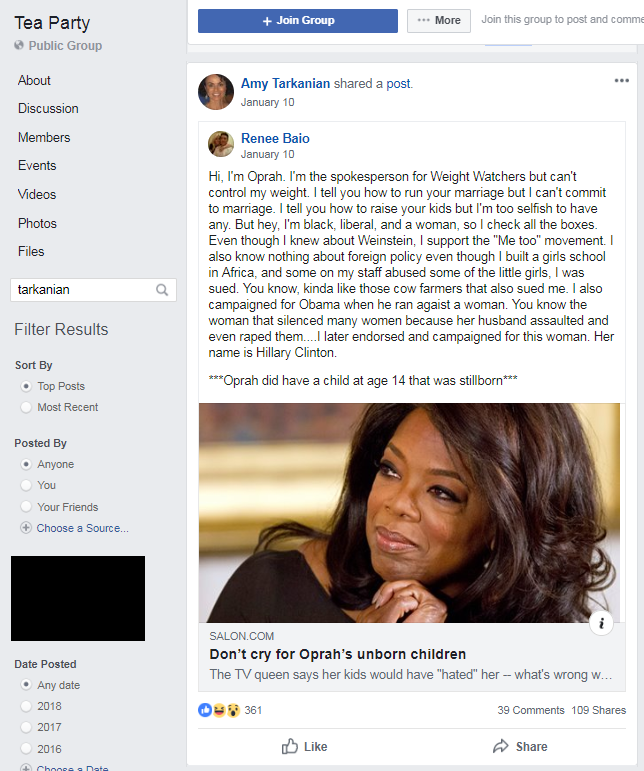 In 2018, she also shared a post attacking Oprah  for her weight and family life. 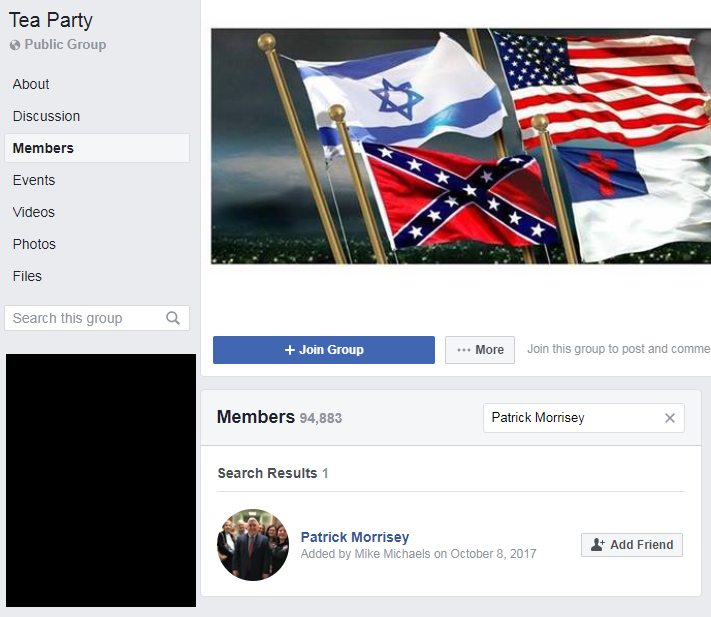 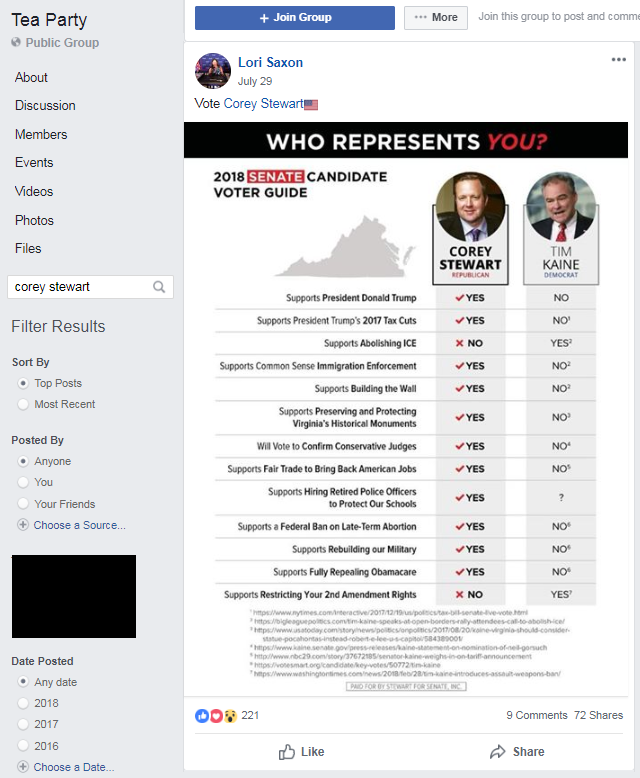 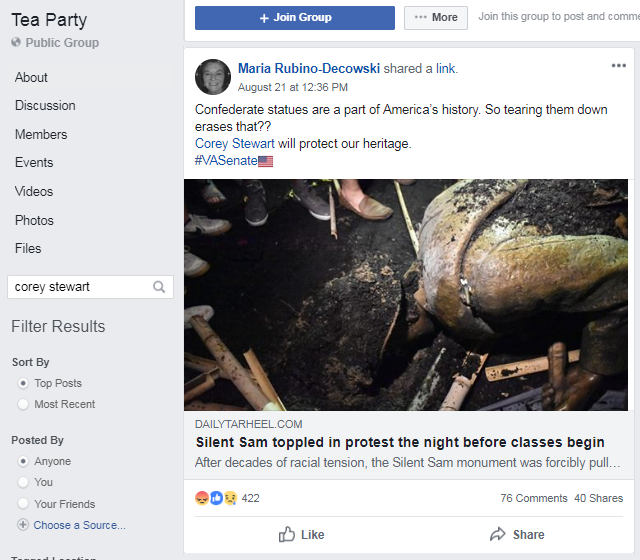 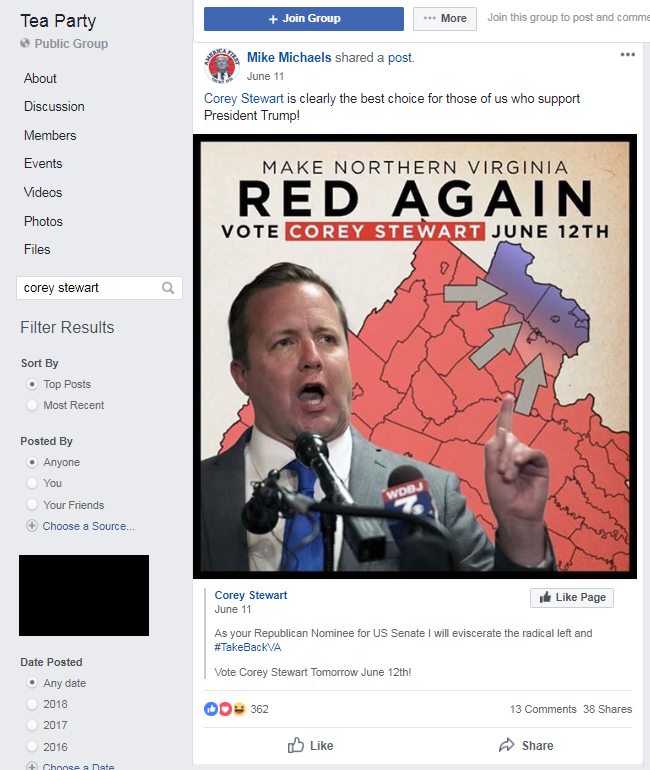 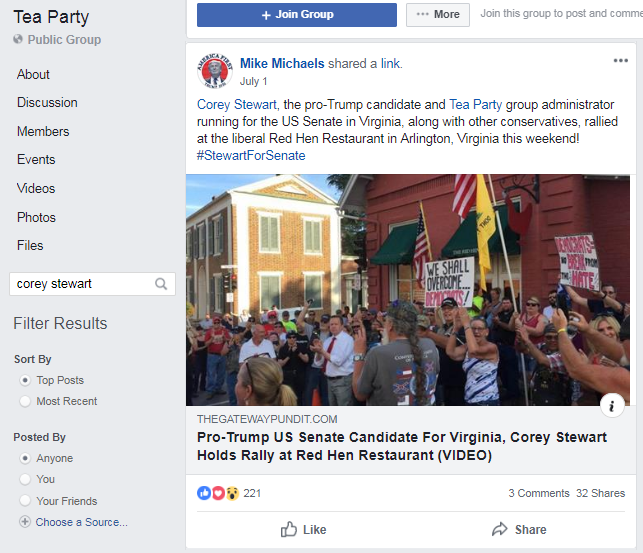 Corey Stewart, a neo-Confederate  candidate in Virginia, joined the Facebook group in July 2017  and has been a favorite of some of the group’s administrators since September 2017 . 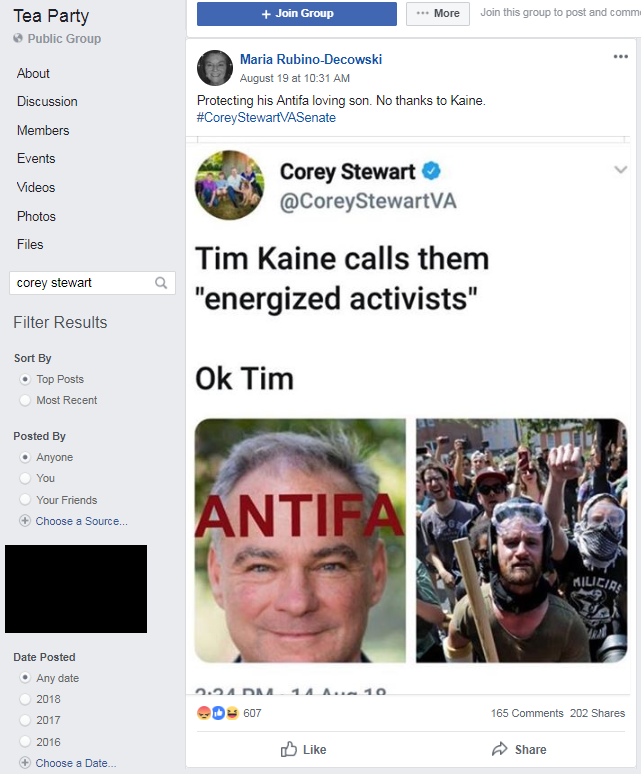 Administrators  promoting  Stewart’s  campaign  have highlighted his anti-immigrant  and  pro-Confederate-statue  positions and amplified Stewart’s social media attacks  against  Sen. Tim Kaine (D-VA). 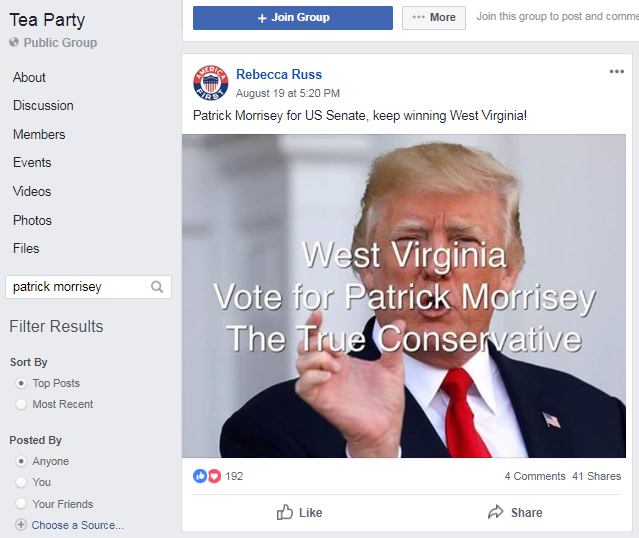 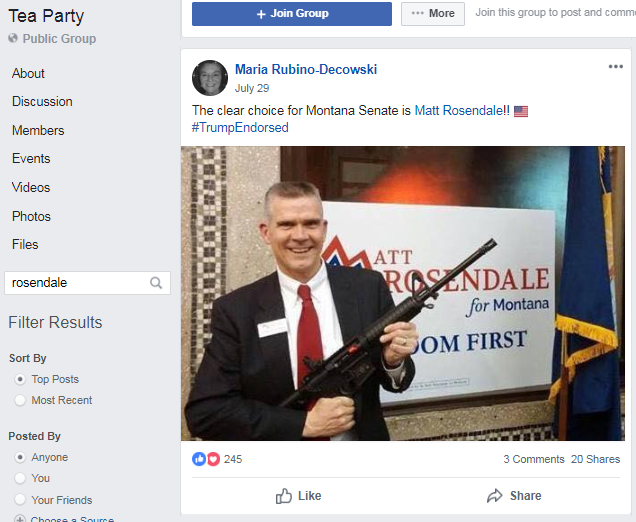 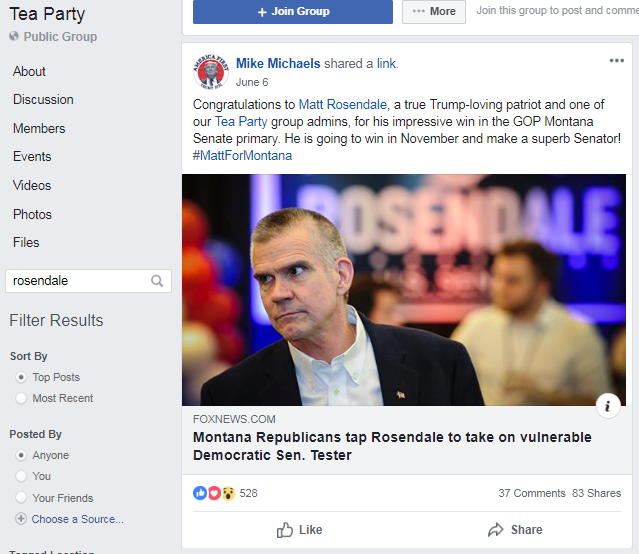 Matt Rosendale and Patrick Morrisey have both been members of the Tea Party group since October  2017. 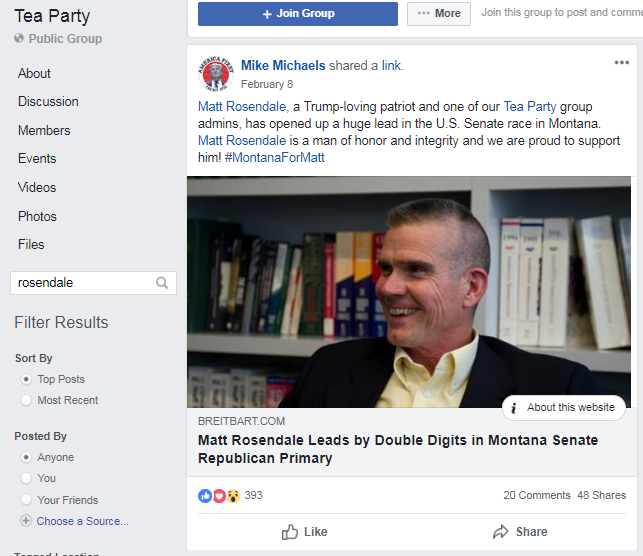 Neither has posted in the group, but other  administrators  have  been  bolstering  their  Senate  campaigns  since they were admitted . 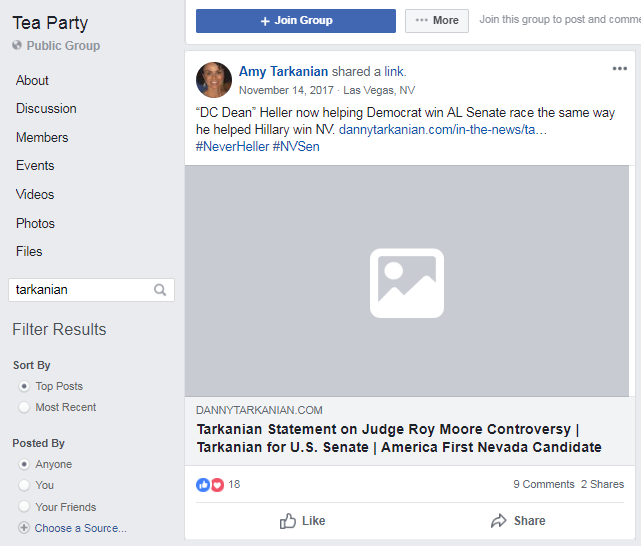 Pamela Geller , an extremist anti-Muslim troll. 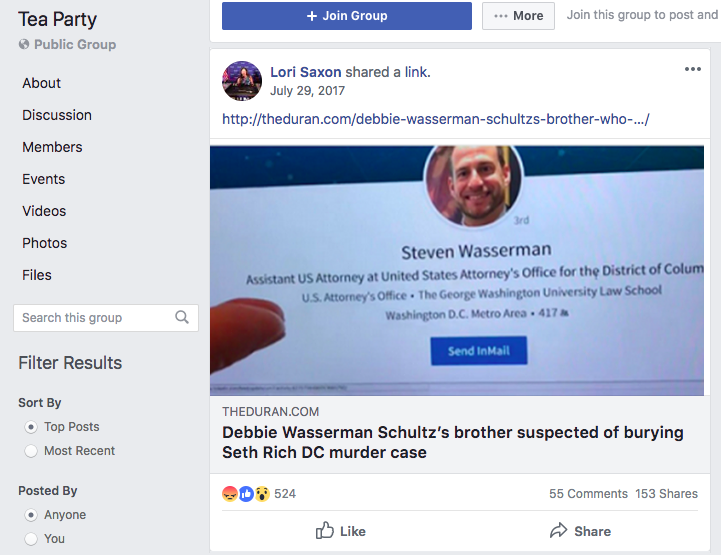 Jack Posobiec , a Pizzagate and Seth Rich conspiracy theorist  currently affiliated with far-right network OAN. 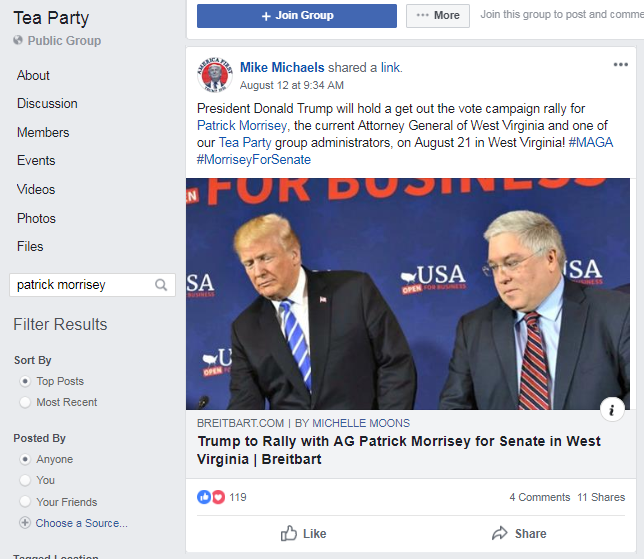 Patrick Howley of the far-right site Big League Politics , which has recently been linked  to a far-right harassment network. 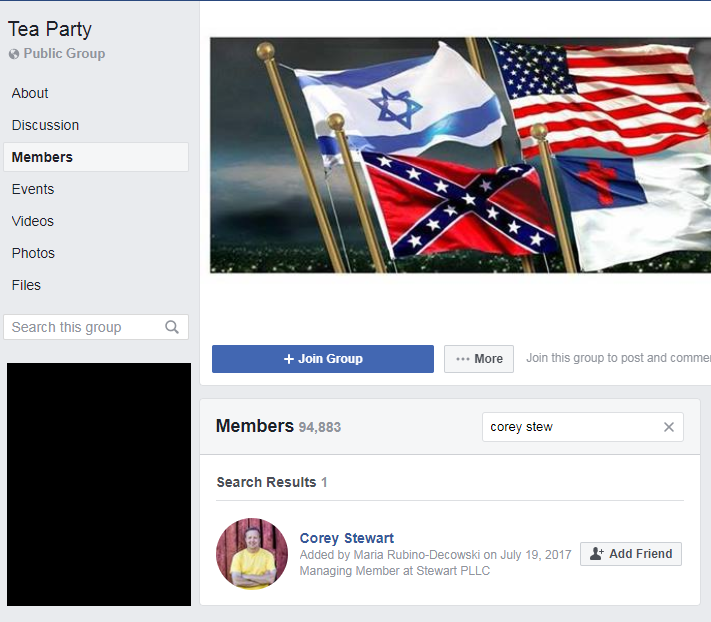 Eliyokim Cohen of the racist fake news site Jews News . 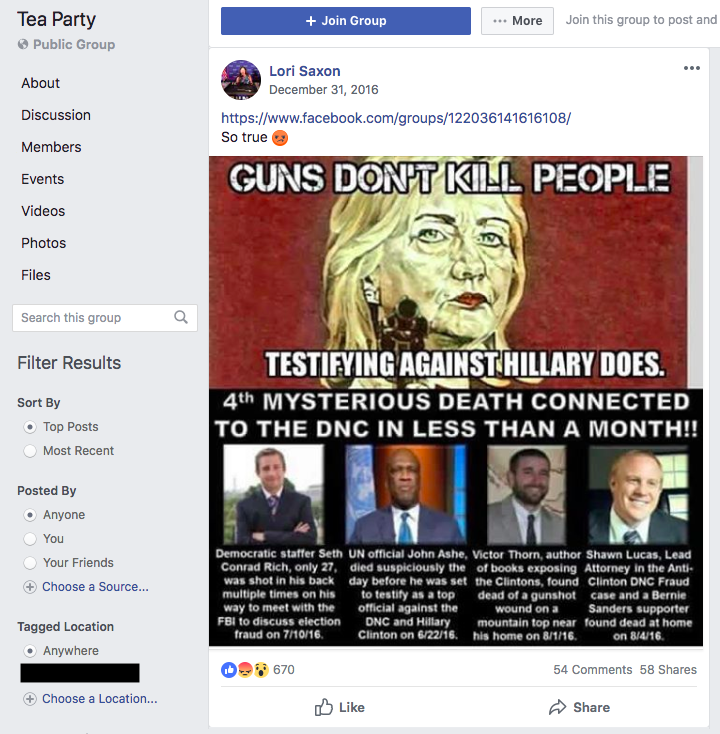 Jan Morgan, an Islamophobic bigot who banned  Muslims from her gun range and serves as the national spokesperson  for "Citizens for Trump." 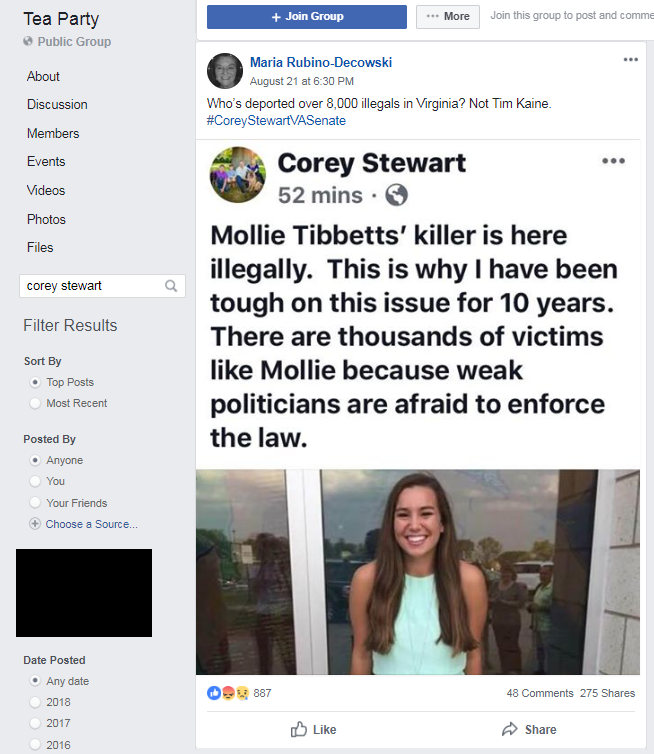 Joe Newby of the far-right clickbait site Conservative Firing Line. 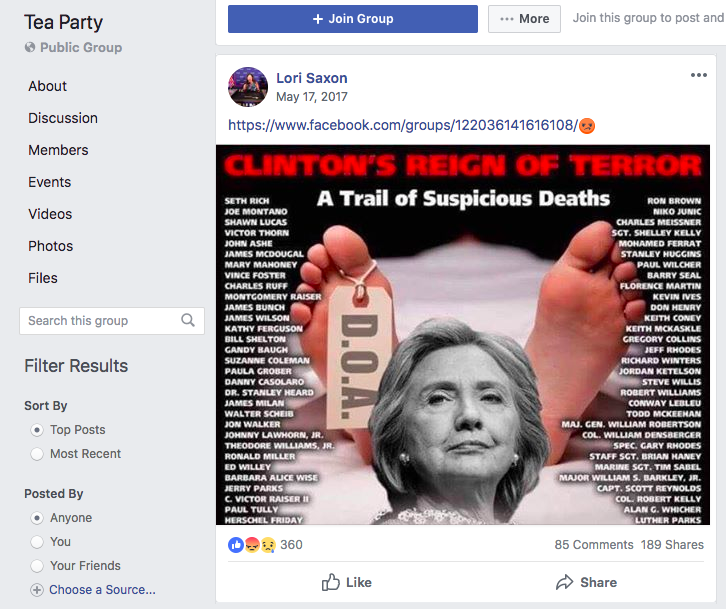 Trevor Loudon, a New Zealand activist and longtime  far-right  conspiracy theorist. 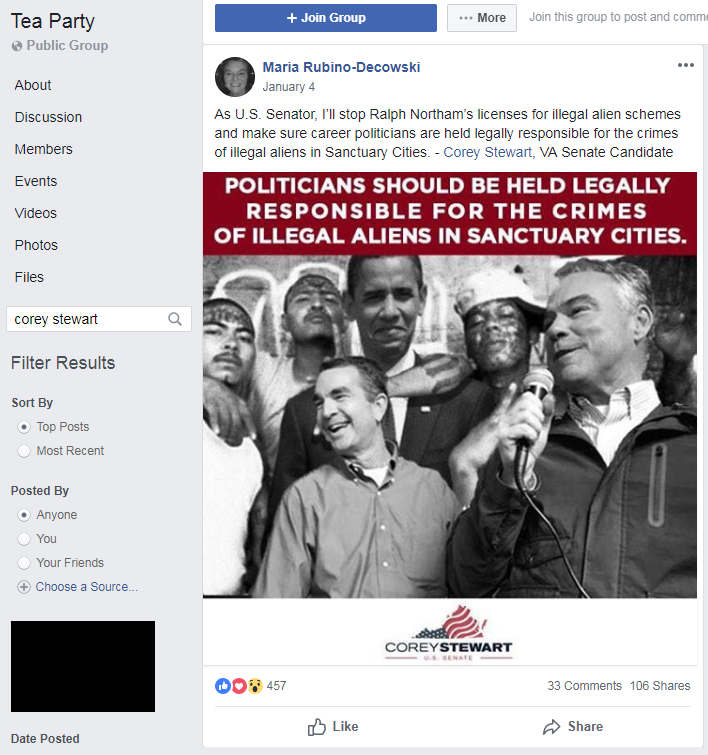 Tom Tancredo, a white nationalist apologist , once columnist for WND and Breitbart, and former congressman from Colorado. 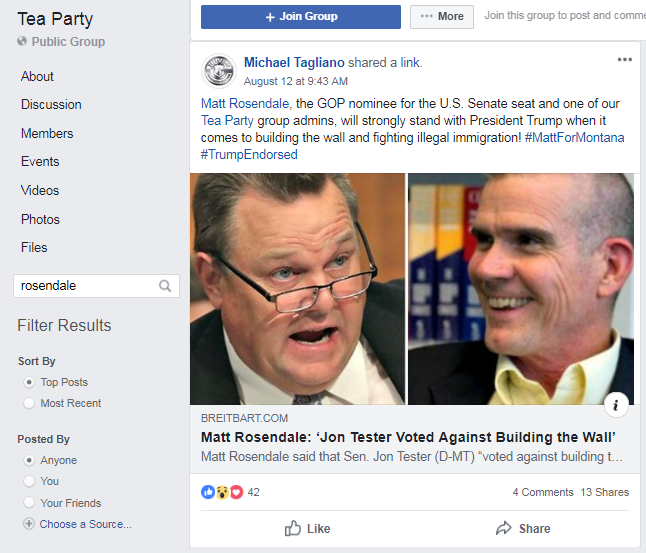 A reader tip contributed to this story, which has been updated for clarity. 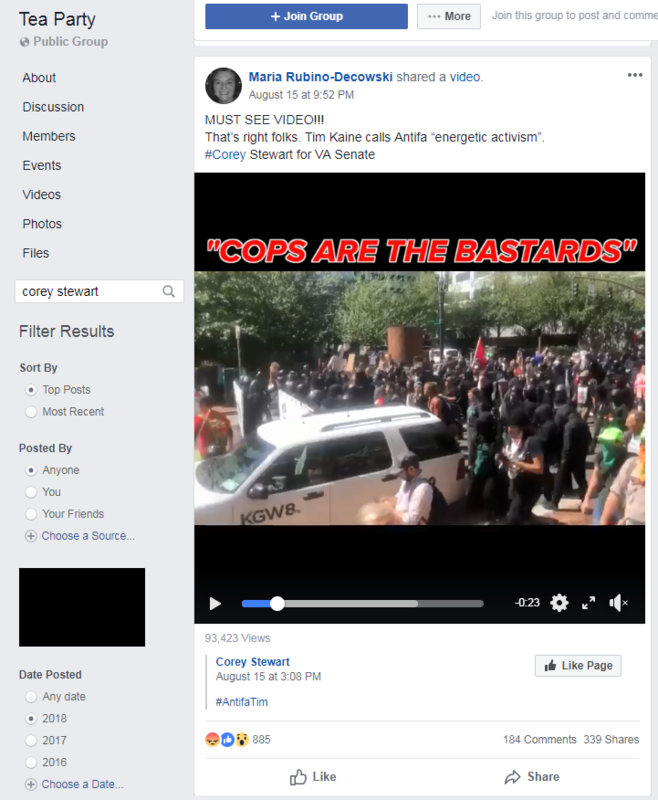 Thank you for your support and keep them coming.